Surprisingly few networks have DFS replication in place. This is something you should not overlook as the uses it has on large networks with many sites can save both time and resource. Here are some of the benefits; you can replicate files to another server giving you some fault tolerance without the expensive of a cluster. 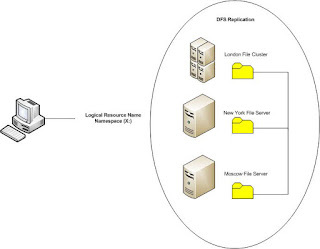 Another plus to this is makes it easy to perform offline work on the server as end users are unaware of the downtime, as well as being able to place profiles on the DFS and have it replicated to all sites so that the end user is always working from the nearest server for quickest response and not loading files over the WAN. Namespace also let you link many network shares into a single network drive despite them being on separate servers and/or locations. It can also be used to help you move resource easier by no longer using a server name but a resource name, allowing hardware and locations to be more easily changed without downtime and remapping resources. Another plus is that you can backup the namespace just once on DFS replicated drives so you don't take multiple backups of the same information allowing you to save money on backup hardware. But remember there are as always some down sides too. Remember one is that you will have make sure you have ether enough bandwidth to support the replication or throttle back the DFS replication to not overload your site links.